Check out the latest RawSpiceBar Coupon on My Subscription Addiction! RawSpiceBar Coupon – 50% Off Subscriptions! RawSpiceBar – Better Than Black Friday 2017 Deal! RawSpiceBar Quarterly Spice Kit Coupon: $6 Off or Free Gift! RawSpiceBar Mother’s Day Coupon – $5 Off Gift Subscriptions! 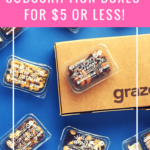 RawSpiceBar Coupon – $5 Off Your First Box! RawSpiceBar Black Friday Deal – First Box for $3! RawSpiceBar Exclusive Cyber Monday Deal – First Box for $1!